Illustration for "The Book of Bridges"
Linked to their fascination with light and study of color, watercolor was an important medium for all the impressionist artists, but it was fundamental to the work of Paul Cézanne. Translucent slabs of pure color are juxtaposed with untouched passages of white paper, which is integrated as a powerful positive element of the composition. Light, fragmentary brushstrokes infuse the painting with a spontaneous, air-filled quality. The watercolor is animated by the floral pattern decorating the white pitcher, the fluted edge of the vessel's mouth and curvilinear handle, and the full, rounded forms of the ginger pot and fruit. The fruit has a solidity and density that goes beyond realism and is typical of the artist's careful contemplation and deliberate rendering of ordinary still-life objects. These fruits contrast with the light-filled, almost insubstantial pale yellow sideboard and the background wall. This watercolor is a magnificent example of the artist's mature work. Dorothy Kosinski, "Still LIfe with Apples on a Sideboard", in Dallas Museum of Art: A Guide to the Collection,_ _ed. Suzanne Kotz (Dallas, TX: Dallas Museum of Art, 1997), 117. Wendy Reves discusses collecting frames. 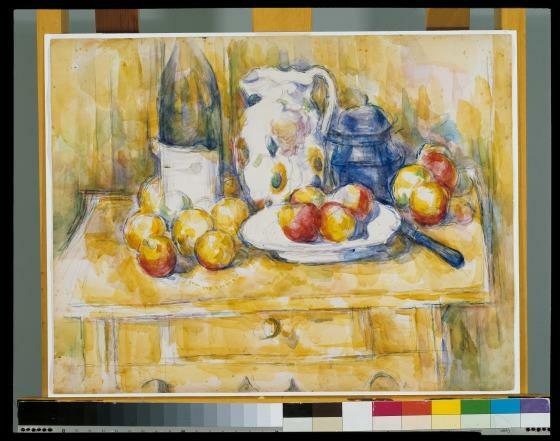 Description of Paul Cezanne's Still Life with Apples on a Sideboard in Reves Collection, 1985.R.12; DMA Collection; Antenna produced? Read a biography of Paul Cezanne from the Met. Read an introduction to the work of Cezanne. View more paintings by Cezanne. Watch a short video to learn more about Cezanne still lifes. Watch this presentation title Paul Cezanne, "Father to Us All" from the Post-Impressionist Series at the Met. 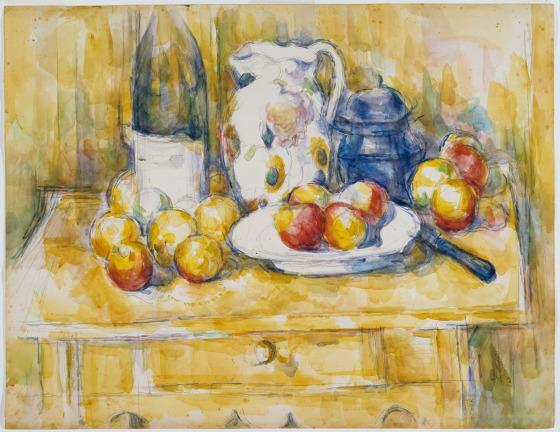 Learn more about the still lifes of Cezanne from National Public Radio. Watch an interview with Alex Danchev, author of Cezanne: A Life, from the Museum of Fine Arts, Boston.